A world-class attraction that offers engaging exhibits and interactive programming which makes a perfect outing for family, friends, school groups and more. Discover the history and enjoy the interactive exhibits and rare artifacts on this Delta Flight Museum. Located at Delta's Atlanta Headquarters - the world's busiest airport - the museum offers a one-of-a-kind experience, an up-close look at the historic aircraft and to shop unique aviation souvenirs. Choose between our public or private tour. Our guided tour of the Delta Flight Museum includes round trip transportation to and from selected area hotels in midtown-downtown-airport area. 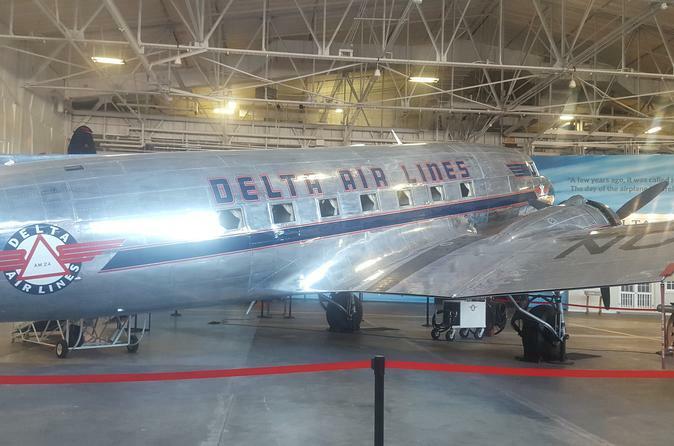 The Delta Flight Museum is an aviation and corporate museum located in Atlanta. The museum itself is housed in two 1940s-era Delta Air Lines maintenance hangars, which were used until the 1960s. Within the museum you will received a guided tour and have an up-close look at the inside of the timeless Douglas DC-3 and a chance to walk on the wing board of the plane as well as get inside the hangars and see the Boeing 747 plane exhibits. Since 1995, the Delta Flight Museum has allowed visitors from around the world to explore aviation history, celebrate the story and people of Delta, and discover the future of flight. The 68,000-square-foot Museum was recently renovated into a world-class attraction that offers engaging exhibits and interactive programming. There is something to see for everyone and you can enjoy a carefree day exploring all that the Delta Flight Museum has to offer.